Successfully Added Deluxe Portable SATA HDD Enclosure + Digital Media Player to your Shopping Cart. Portable SATA 2.5 inch HDD (hard disk drive) enclosure and digital multimedia center. 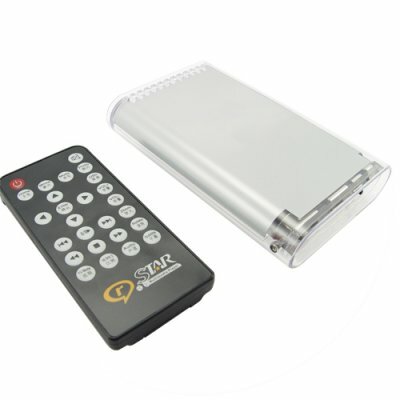 This high performance portable storage drive and digital media center uses high speed USB 2.0 to connect to your computer when used as an external HDD and connects to your TV by composite or component cable (with resolution up to 720P) when used as a media player. Using this unit as a hard drive enclosure means you have a rugged casing that allows your SATA HDD to be used via USB 2.0 with your PC or Mac. Mere words cannot do justice to this casing, as it is made of heavy gauge molded polycarbonate with an aluminum diecast finned bottom to allow efficient head dissipation, therefore eliminating the need for a noisy fan. This model works great as either a tough travel-ready HDD or as storage drive that does not take up valuable space on your desktop. When used as a media center / player, this unit simply hooks up to your standard television or HDTV so you can comfortably watch all of your videos, listen to music or even view a slide show of your favorite photos on the big screen. The embedded software has user friendly menus with handy thumbnail previews and is controlled by the included remote controller, giving you easy access to your personal digital media collection while playing most of todays popular digital media formats including MPEG-1, MPEG-2, MPEG-4, and more. Well-built 2.5 inch SATA enclosure is the perfect companion for transferring data from computer to computer, backing up important files, and using as a digital media center for your TV! Excellent functionality and compatible with wide range of movie, audio and image formats including MPEG-1, MPEG-2, MPEG-4, AVI, DivX, XviD and RMVB. Compatible with a wide range of movie, audio and image formats including MPEG-1, MPEG-2, MPEG-4, AVI, DivX, XviD and RMVB.